The hotel is located in the beautiful and quiet Tatranské Matliare, at the foot of the Lomnica Peak (Lomnický štít), approximately 2 km from Tatranská Lomnica. In the surroundings you can find the Pramenište natural reserve. In the summer season, Tatranské Matliare is an ideal starting point for hiking tours into the eastern part of the High Tatras. The surrounding area offers trails suitable for mountain cycling. In the winter season, skiers can enjoy nearby ski resorts, the surroundings of the hotel are also suitable for cross-country skiing. In the Hutník I. hotel, rooms are renovated and offer comfortable accommodation in suits, single and double rooms with extra beds available, equipped with a bathroom, WC, telephone, satellite TV. In the Hutník II. hotel, rooms are not renovated, with extra beds available, equipped with a bathroom, WC, telephone, satellite TV. Most rooms have a balcony. WiFi access in the reception area and the hotel lobby. Free parking. In the hotel, there are two restaurants and two snack bars. 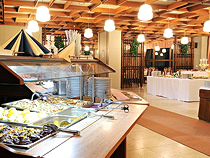 In the Hutník I. hotel, breakfast and dinner are served in a buffet style manner, lunches are served as chosen from the offer. In the Hutník II. 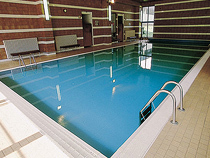 hotel, breakfast is served in a buffet style manner, lunch and dinner are served as chosen from the offer.